a bottleneck for the future development of the industry. tional Civil Aviation Organi- zation (ICAO) . the flight between the aircraft and the ground stations. cally close to their access networks. main may be geographically remote from the aircraft. rately handled by different routing systems in an aircraft. R. S. KONG ET AL. Figure 1. Topology of the aeronautical network. in Section 5 is the conclusion. network attaches to the Internet. by the HA, which leads to the “triangular routing”. and thus improve the availability and the bandwidth. bile devices taken by passengers in the PIES domain. NEMO scheme, the SCTP protocol and the HIP protocol. without bypassing the HA (see Figure 2). for each of the Mobile Network Nodes. 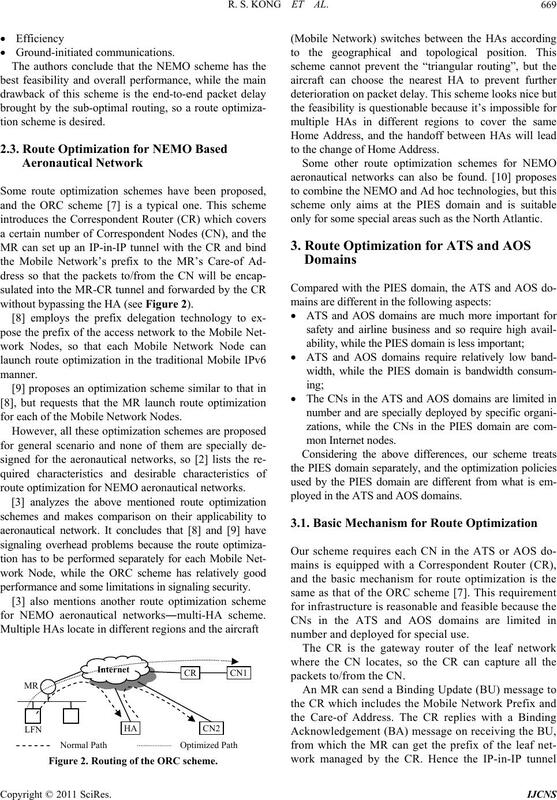 route optimization for NEMO aeronautical networks. performance and some limitations in signaling security. for NEMO aeronautical networks―multi-HA scheme. Figure 2. Routing of the ORC scheme. to the change of Home Address. only for some special areas such as the North Atlantic. ployed in the ATS and AOS domains. number and deployed for special use. allocated to each CR besides its own unicast address. mation and launch route optimization to the CR. authentication information needed in BU message. the Mobile Network Prefix through this procedure. Figure 3. 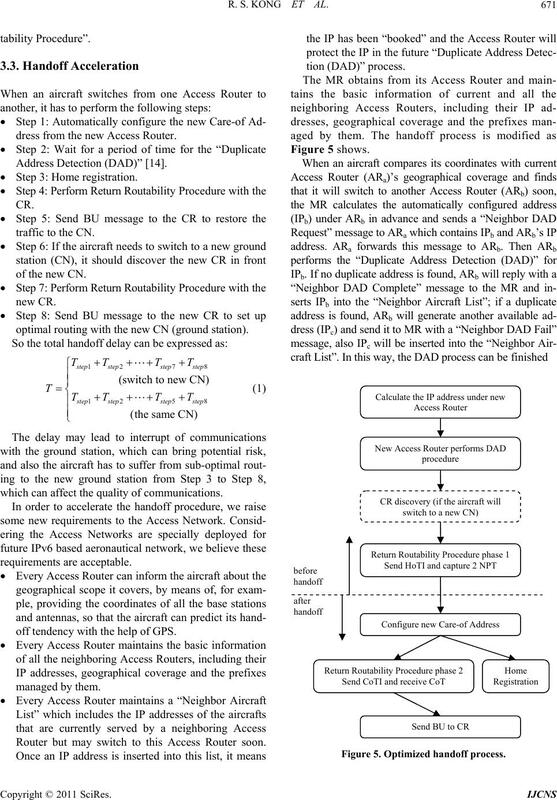 Return Routability Procedure signaling. MR’s Home Address as the source address. uses the MR’s Care-of Address as the source address. dress from the new Access Router.  Step 3: Home registration. optimal routing with the new CN (ground station). which can affect the quality of communications. off tendency with the help of GPS. Router but may switch to this Access Router soon. Figure 5. Optimized handoff process. the routing to some extent. are effective only in some special scenarios. and let the passenger choose which HA to use. and it has two HAs―one in China and one in Europe. Edition, Unedited Advance Version, February 2009.
als, Vol. PP, No. 99, 2010, pp. 1-16.
in IPv6,” RFC 3775, June 2004. R. Wakikawa, V. Devarapalli, G. Tsirtsis, T. Ernst and K.
February - 1 March 2003, pp. 1194-1200. Orlando, 4-7 October 2003, pp. 2035-2038. 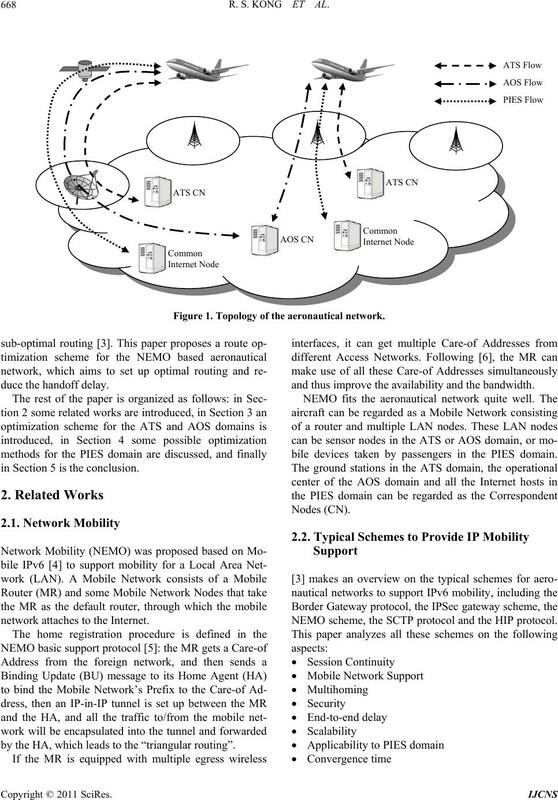 (IPv6) Addressing Architecture,” RFC 3513, April 2003. 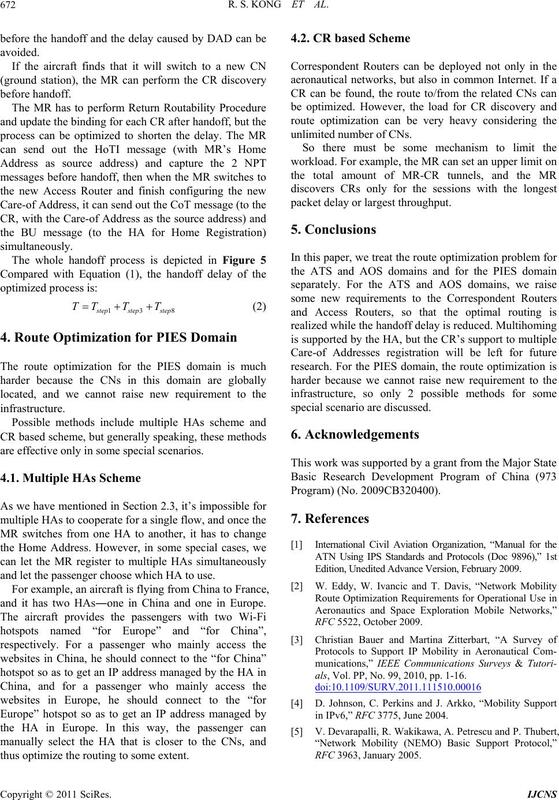 (IPv6) Specification,” RFC 2460, December 1998.